Prototype: Heavy steam freight locomotive with a type 2´2´T30 tub-style tender (former class 42). Luxembourg State Railways (CFL) museum locomotive. Black basic paint scheme with black wheels and side and drive rods inlaid in red. With standard design Witte smoke deflectors, pilot truck wheel set with solid wheels, rail clearance devices with large scoops, both lower headlights in the front of the locomotive built into the cylinder block. No smokebox access step below the smokebox door. With a clearance gauge on the tender. Locomotive road number 5519. The locomotive looks as it currently does in real life. 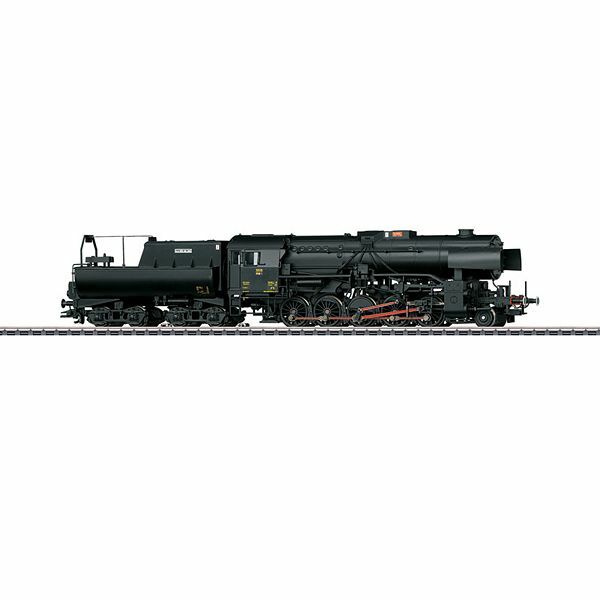 Designed as a class 42 DRG wartime locomotive, built in postwar Austria, and acquired as a bargain by the Luxembourg State Railways (CFL) in 1948/49, this is the best way to characterize the 20 class 55 locomotives. They showed their abilities best hauling heavy coal and iron ore trains. Road number 5519 remained preserved after the locomotives were retired in 1964, initially as a memorial locomotive in Bettembourg. Taken from its pedestal there in 1989, it has been an operational CFL museum locomotive since October 4, 1991 for special runs under steam and frequently brings pleasure to steam locomotive fans in neighboring countries.